As 2012 comes to a close, I am reminded of the great service that FamilySearch and its volunteer indexers have provided this year. Give back by signing up to index here. Below is their latest announcement. FamilySearch added an additional 38.5 million new, free indexed records and images this week to its collection. Notable additions include the 6,095,759 indexed records in the new United States World War II Army Enlistment Records collection, the 4,068,907 indexed records for the new United States, Germans to America Index from 1850-1897, the 2,922,943 added to the England and Wales Census of 1871, and the 2,608,645 added to the Denmark Estate Records collection from 1436-1964. Other new searchable collections online were added this week for Brazil, China, England, Ireland, Italy, Russia, Spain, and the United States. See the table below for the full list of updates. Search these diverse collections and more than 3.5 billion other records for free at FamilySearch.org. Thanks to guest blogger, Lisa Alzo, for the article below. I don’t know about you, but I can’t believe that we are just days away from saying “so long” to 2012! The festivities surrounding New Year’s Eve often prompt us to make resolutions (I prefer to use “set goals”). If you’re looking to improve your genealogical research and writing skills in the New Year, here are 13 (for 2013) easy resolutions you can make and keep! 1. Make a plan. Do your past research habits include just randomly typing names into online databases, or Googling an ancestor’s surname? Then it may be time to change them. Developing a Research Plan to focus your research tasks and keep a research log to track your searches. Not sure how? “Plan Your Way to Research Success” (on CD) can help get you started. 2. Clean up your family tree. As genealogists, it’s useful to review our family trees for incomplete or incorrect data that can impede future research success. 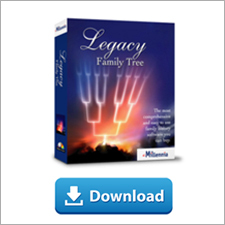 If you don’t have a copy of Legacy Family Tree 7.5, consider investing in it now, or if you’re already a Legacy 7.0 user, don’t forget about the free update. 3. Tidy your sources. Slacking off on those proper source citations? The New Year is the perfect time to remedy this bad habit. Learn how with a copy of Evidence Explained. 4. Back up your data. Start the year off right by backing up your family tree, digital images, and critical research documents. Make an appointment to do this regularly. Get advice from Thomas MacEntee’s Webinar-on-CD. 5. Contact those cousins! You never know who holds the missing pieces of your family history puzzle. Social media makes it easier than ever to reach out to relatives and find family—do it before it’s too late! Use Legacy Family Tree's Interview Questions (over 1,200 to choose from) to ask just the right questions. 6. Record family stories. This year, go beyond the “name gathering” and dig deeper to learn answers to the “Why?” questions. Using an app like Saving Memories Forever makes it easy. 7. Scan those photographs! In 2012, we were sadly reminded that disasters happen and how painful it is to lose precious family photographs. Learn how to scan and preserve them with a copy of Digital Imaging Essentials by Geoff Rasmussen. 8. Join a genealogical/historical society. Not everything is online! These organizations offer untapped resources and networking opportunities. Check with the Federation of Genealogical Societies or use Google to find one you like. 9. Explore a new resource. Using the same databases over and over? 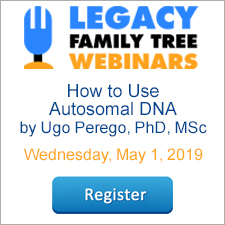 Learn about new resources and techniques for finding female ancestors, using land & property records, Croatian genealogy, and more, with Legacy Family Tree’s QuickGuides™. 10. Attend a conference. Whether it’s your local society’s seminar, or a national conference, try to make at least one 2013 event. Check Conference Keepers for a list. Can’t leave home? There are live streaming events (e.g. from RootsTech), and Legacy Webinars (see #13). 11. Attack a brick wall. Dedicate 2013 to defining a brick wall research problem and make plans to attack it head on. Get help from the Legacy Brick Walls Bundle CDs. 12. Publish your research. Take your research beyond the “boxes and lines” and considering sharing your findings in a blog or a book. Learn how with the “Ready, Set, Write!” CD. 13. Learn something new. Legacy Family Tree’s 2013 Webinar schedule has more than 40 classes from genealogy's leading educators. With over 60 hours of free genealogy education, there’s no excuse not to improve your knowledge or skills! Wishing you an abundance of genealogical success in 2013! Click on the Reports icon in the main toolbar. Click on thePedigree tab. It is also available in our brand new Ireland webinar CD bundle which includes all three of Judy's Ireland webinars (about 4 1/2 hours and 13 pages of handouts). Click here to purchase. Legacy QuickGuidesTM are quickly becoming one of the more popular resources for genealogists. Each guide contains four pages of valuable information covering a variety of genealogy research topics, and are written by genealogists and family historians who are experts in the subject areas. Today we announce the availability of three new Legacy QuickGuides: Using Historical Newspapers for Genealogy Research by Julie Tarr, Preserving Family Heirlooms by Denise Levenick, and Starting a Family Archive by Denise Levenick. Are you the keeper of the “family stuff,” boxes of documents, photographs, and memorabilia? Get straightforward tips on how to care for and preserve your family treasures in the Preserving Family Heirlooms Legacy QuickGuide™. Learn the best storage strategies for scouting and military memorabilia, toys, china, documents, correspondence, photographs, and more. Discover online resources for appraisers, conservators, archival storage suppliers, and conservation experts. Available in a laminated 4-page printed guide. A curator and a collector have a lot in common: both selectively acquire, care for, use, and display special things. A family curator is a collector of family artifacts and memorabilia. Like any kind of collection, even family treasures can become overwhelming if they are not effectively organized and stored for preservation. The Starting a Family Archive Legacy QuickGuide™ is packed with essential information and basic strategies to help you organize a family archive in your home and find resources for restoration, preservation, and disaster recovery. Preserve what is important to you, to your family, and to your community!